Individually manufactured and tailored to major automated fiber placement processes, cevoTape offers a new option for series production at reasonable economics. “Automated fiber placement processes require superior tape quality to minimize downtime and ensure high precision and repeatability”, explains Felix Michl, CTO of Cevotec. 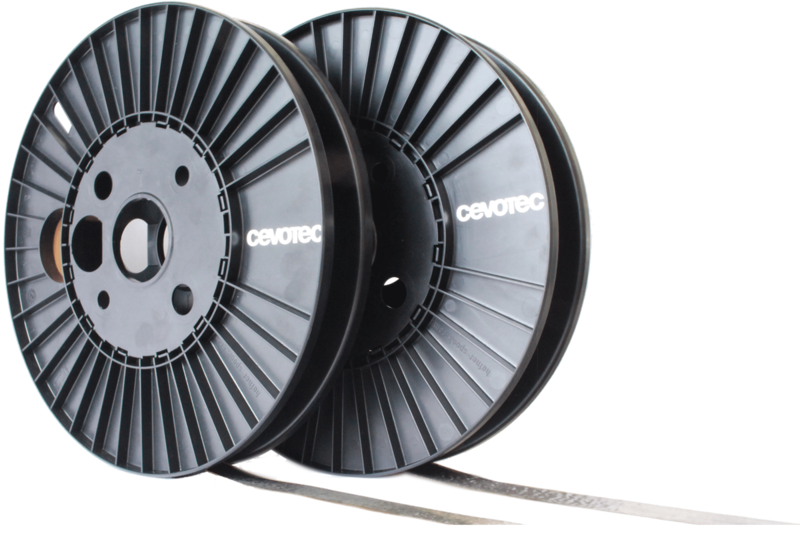 As the right fiber is crucial for the quality of a composite part, Cevotec developed cevoTape, a dry-fiber spread tow made from high-quality carbon fiber rovings, bindered with a copolyamide adhesive. Cevotec processes its own unidirectional carbon fiber tape (spread tow) in the SAMBA Series Fiber Patch Placement systems. But cevoTape is also perfectly matching the requirements of other automated fiber placement processes like AFP and ATL to create high quality laminates and can be used for a variety of different applications. cevoTape has a customized width within minimal tolerances and thanks to an integrated quality monitoring, it features a homogeneous filament distribution. The single-sided, uniformly distributed PA-Binder (Spunfab: PA1541, PA1300, further materials on request) is activated at temperatures from 90 to 160°C. Thus, cevoTape can be easily fixated during processing, and – another benefit – stored at room temperature. “Customers may approach us with roving material of their choice and have us manufacture their individual tape”, says Michl. “We process any high-quality fiber.” Alternatively, there are pre-configured tapes using Tenax-E HTS45 fibers on stock, featuring 20 or 30 mm width and 80 – 107 gsm areal weight, separated with paper film, stored on Häfner spools (250 m, custom lengths on request). Besides compatibility to the SAMBA Series manufacturing systems, Cevotec guarantees highest quality for all major placement processes as well as the dimensional tolerance of the tape that allows manufacturers to attain the high placement and operating precision they desire. “Such a tape quality achieves outstanding results in production processes and allows the economic application of AFP / ATL processes in non-aeronautic applications”, concludes Michl. Cevotec enables manufacturers to build complex fiber composites in high volume and quality – by smart process automation based on Fiber Patch Placement technology. With SAMBA Series, Cevotec offers tailored, automated fiber layup systems for challenging 3D geometries and laminates with complex fiber orientation. ARTIST STUDIO is the matching CAD-CAM software for generating patch-based fiber laminates and automated robot programming. Along with development services that include FE-based modeling and simulation, Cevotec offers the entire process chain from digital design to final fiber product.